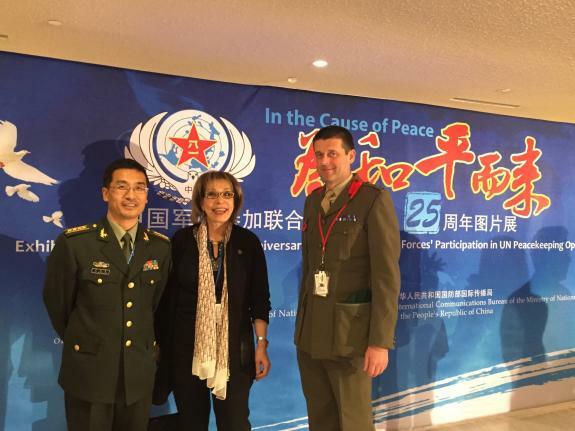 President Sally Kader joined the United Nations Chinese Mission in celebrating the 25th Anniversary of the Chinese Armed Forces' Participation in UN Peacekeeping Operations. An exhibition was set up in the United Nations Headquarters detailing the history and relationship between the Peoples' Republic of China and the United Nations, a history spanning more than 25 years. In a statement delivered by Ms. Cristina Gallach, the Under-Secretary General for Communications and Public Information, praise was given to the contribution that the Chinese Armed Forces have made to the United Nations Peacekeeping Operations, and emphasized the United Nations' willingness to continue fostering this partnership. After the opening remarks and welcome speech, President Kader browsed through the photos and joined representatives from the United Nations in sharing her warmest welcome to the chinese military commanders, acknowledging the distinguished achivements of the Chinese Armed Forces.